This column originally ran in Ulster Publishing’s newspapers on June 2, 2005. Most of the year I don’t buy asparagus because it’s so good right now, harbinging spring’s turn to summer. 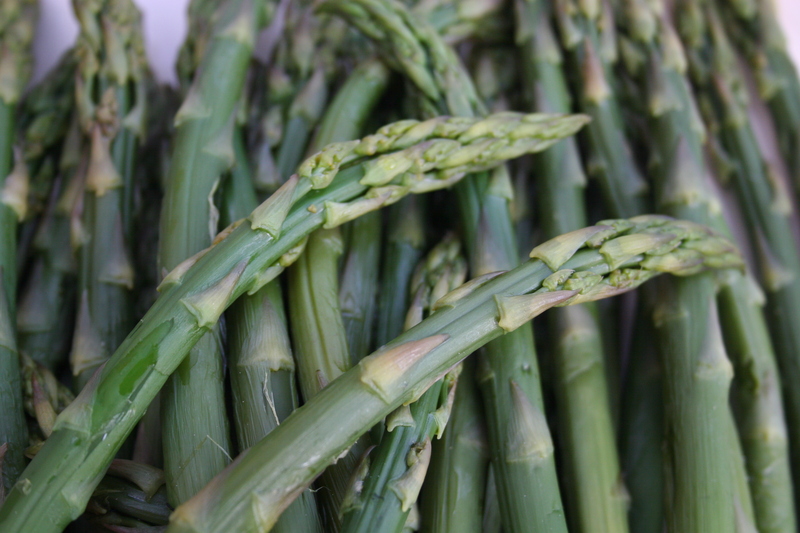 At its best, asparagus on the tongue is like the color green on the eye, with a flavor like no other vegetable. Both fancy and farmy both, it goes with everything and can be cooked just about any old way, as long as the timing’s right. Asparagus isn’t so good undercooked and crunchy, nor is it when stringy and mushy from too long on the fire. But when cooked correctly it talks back to your mouth gently, with the slightest crispness, barely tender, sweet and perfect. In Latin languages, nouns are male or female, and in Italian most vegetables are feminine, but il asparago is a masculine word. Whether for its mild urinary-tract-irritating qualities or its form, it has historically been considered an aphrodisiac. Nuns banned it from the tables of girls’ schools 200 years ago because of the potential effect of the firm stalks on the appetites of the young pupils. I have never peeled its skin off with a paring knife before cooking it, nor tied it in kitchen string and steamed it upright in a tall narrow pot so that the tips merely steam while the stalks boil below, like I have read in too many cookbooks to count. I have never had it with sauce maltaise, an orangey eggy hollandaise said to be perfect for it. I have never reserved the stalks for “another use” and served just the tips with brains or sweetbreads, as Child, Bertholle and Beck recommended in Mastering the Art of French Cooking (Knopf, 1961). I have never had purple asparagus. I have never made guacamole out of it as Gourmet magazine recommended in its May 2003 issue. I’ve never made Asparagus in Ambush, whose name sounds much more promising than the actual dish: asparagus in custard in hollowed out rolls. I’ve never had asparagus coated in beer batter or panko and fried. I don’t think I have ever even made asparagus soup. But I would like to try all these things, because I love asparagus. In season and freshly cooked it needs little gussying up to be scrumptious. Its classic partner is egg, in a quiche, frittata or timbale (molded custard), or mixed with or tucked into or topped with eggs hard-boiled, soft-cooked, scrambled or fried. Any manner of egg goes with asparagus. But it goes, too, with stronger partners like bacon, horseradish, mushrooms or goat cheese. And it pairs well with other vegetables that are in season at the same time, like ramps, morels or fresh fava beans. Last week I found some fresh-picked asparagus at Gill Farm Stand in Hurley (Rt. 209 as it heads south out of Kingston) for $1.49 a pound [Ed: this was 2005], and was told it should keep popping up until around Father’s Day. I cooked some spears by James Beard’s favorite method, putting them in a shallow pan with salt and water to cover, topping with a lid and cooking them until they no longer smelled raw, a little knife went in with only the slightest resistance, and they passed the ultimate test: a sacrificial spear tasted just right. I made a little vinaigrette by stirring a dab of Dijon with a goodly splash of red wine vinegar and adding a little fresh chopped parsley and dill, snipped chives, extra virgin olive oil and salt and pepper, which I poured over the cooked spears. When the asparagus is that good, this is easy and tasty whether you eat it still hot from cooking, room-temp-warm or cold out of the fridge. What was left, about three-quarters of a pound, I made into an Italian frittata the next day—skip this part if you are already a frittata expert: I cut it into inch-long pieces and sautéed it, seasoned with salt and pepper, in olive oil until barely tender. Then I stirred six eggs with a splash of milk, a splash of Tabasco sauce, grated pecorino romano cheese, and more salt and pepper. Then I tossed the mixture with the asparagus, splashed some more oil in my 10-inch cast iron skillet, and on low heat, poured in the whole mess and cooked it, turning the pan now and then, until the edges were set but the middle still runny. Then I put it under the broiler for two minutes, until the top was golden brown. This is excellent hot for dinner with crusty bread and salad, or cold out of the fridge the next day in a sandwich made with more crusty bread, or just plain as a snack out of the plastic wrap you wrapped your leftovers in. This week I bought some more asparagus, at twice the price, across the river at a farmers market where I also found ramps (wild leeks). I browned butter in a 12-inch cast iron skillet, along with olive oil, threw in the ramps which I had trimmed of their roots and soggy parts and chopped coarsely (I admit I was a wild leek virgin, not sure what to do with them). When they had cooked down and caramelized a bit I threw in diagonally sliced asparagus, cooking more and throwing in some chicken broth and lemon zest as I went along. This mixture once cooked I tossed with Barilla penne, a splash of milk and a fair amount of grated pecorino, and served it for lunch on the patio with a fine Chilean white wine brought by a guest. I don’t know if they have ramps in the Mediterranean but I felt like I was there. And it was a marriage of cousins—ramps are onions and asparagus is a member of the lily family, which includes onions, garlic and their ilk—but it was sublime. I have some stalks left, so fresh that the violet-tinged buds at their tips are tight still, and I am torn about what I will do with them. I’m leaning toward a risotto, or maybe just steaming or roasting them and topping them with a sauce gribiche of hard-boiled egg yolks mashed up with oil and vinegar, adding salt and pepper, chopped gherkins, capers, fresh parsley, tarragon and chervil, the egg white slivered into fluff and tossed on top. This, too, I have never done with asparagus. But it will have to be tomorrow, not the day after, because like corn, asparagus’ sweetness turns to starch fast. The fresher the better. Should you eat asparagus with your fingers or your fork? Should you peel it? Should you pick fat or skinny spears? That’s up to you. But if not lust-provoking, it does provide vitamins A, C, E, calcium, phosphorous and potassium. And it doesn’t really make your pee smell—that’s a genetic component of your personal olfactory nerves that makes you perceive it—the rest of us don’t even notice.